Wheems is an ecological and organic 6 hectare horticulture and animal smallholding, producing organic food for a local market. Wheems farm buildings are 200 years old and have been renovated using local, traditional and sustainable materials. On arrival you will see the timber pods at the top of the track. Your name will be on the blackboard outside your pod and the pods all have the relevant bird painted on the outside. Looking up the hill, Curlew pod is beside Oyster Catcher pod at the top right of the campsite nearest the sea. Please make yourself at home when you arrive, there is a key in your door. The pods are 8'10" x 6'6" / 2.69m x 1.98m they fit up to 4 people on futons but 2-3 is better as you may need the floor space. They have bedding, towels, blankets, lamps, electric sockets and a heater. Each pod has 4 futon mattresses that fold up or roll up. We can provide a bedding for a couple on the futons together and this includes a double mattress topper / dble fitted sheet / duvet / pillows. Let me know otherwise singles will be provided. You don’t need to visit reception unless you need to pay your balance / require anything / would like to say hello! Our kitchen is basic but fully equipped with an open kitchen area, kettles, pots, pans, crockery, small oven, 4 hobs, fridge freezer. The kitchen does not have a door and everything in there is second hand or upcycled, it is open to the weather - camping style. There is a solwise wifi plug in the kitchen, the password is on the plug. We have a honesty shop and potted herb garden, organic wholefoods, fresh eggs, bread, in season organic produce from the farm. Please help yourself to the herbs and salad leaves that we have planted for you, there is a watering can so if the plants look thirsty please feel free to help us water them! You can drive onto the camp ground to offload your things but we like to keep the campground free of cars as the view is better without them and there are sometimes children running around. The car park is signposted at the top of the track on your left beyond the tractor shed, parking in the car park is free. 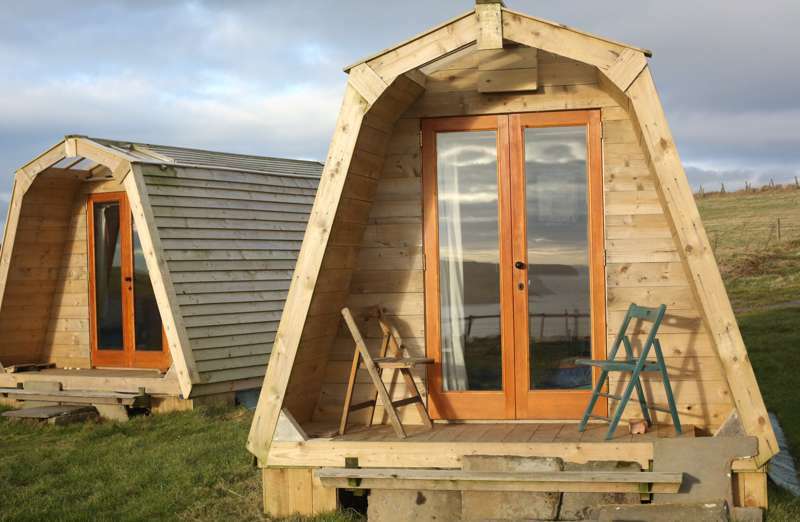 An organic smallholding in Orkney with yurts, pods, bell tents – and a cosy cottage! Wheems Organic Farm is an ecological and organic 6 hectare horticulture and animal smallholding, producing organic food for a local market. Wheems farm buildings are 200 years old and have been renovated using local, traditional and sustainable materials. Wheems farmland has been sensitively landscaped with areas set aside for conservation, areas carved out with stone dyke walling, and areas of tree planting. BBQs and small campfires allowed. There are 2 showers and 3 toilets in a wooden building by the bothy. The brand new campers' kitchen has 2 small electric cookers and kettle with lovely wooden surfaces, including tables, chairs and a little lawn with a stone bench. They also have a washing machine, large fridge, freezer and a hairdryer, plus books and games for the kids. Each bothy is provided with bedding (optional), a heater, water container, rechargeable lamp and hot water bottles. The yurt is more lavishly furnished, with a custom made wooden floor, beds, bedding, blankets, towels, candles, lamps, a log fire and firewood for your stay. Islay can provide you with a camping stove for the yurt if you would rather this than using the shared kitchen. Each pod sleeps two to three people in comfort, but can accommodate four people; the yurt can sleep three adults (or a couple with two small children), the bell tents and the cottage both sleep three people and the loft sleeps 4. Camping from £9; motorhome from £12; bell tents £30 a night, £180 a week; pods £40 a night, £240 a week; yurt & loft £50 a night, £300 a week; cottage £70 a night, £420 a week. The easiest way to reach Wheems Farm is to take the ferry from Gills Bay on mainland Scotland to St Margaret's Hope, South Ronaldsay, which is just a couple of miles from the farm. There are also summer passenger ferries from John O'Groats to Berwick on South Ronaldsay, and from Aberdeen to Kirkwall, a half-hour drive away. It takes about the same amount of time to drive from Kirkwall airport. There’s a reasonably frequent bus service in the summer months from Kirkwall to St Margaret’s Hope (plus there’s the ferry) but then it’s a 2-mile walk from the village. April to October or by arrangement.